In Monday night's third episode, “2:00 PM -3:00 PM,” of Fox’s 24: Legacy, the drama introduced the first gay characters in the history of the series. Seems no show today can be without at least one LGBTQ character and storyline. On the front of the paper's Friday Arts section, New York Times TV critic Neil Genzlinger checked out the reboot of the popular serial thriller “24,” making its debut after the Super Bowl Sunday night on Fox. But Genzlinger was less concerned about the action and more about the show's supposedly anti-Muslim messaging in this sinister Trump era: "...certain people, including some now working in the White House, can’t, or won’t, separate the real from the fake when it supports their interests or beliefs...an insidious part of human nature thrives on having somebody to hate." Editor's Note: The following was originally posted at Andrew Breitbart's Big Hollywood. 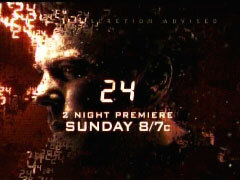 Before the series finale of “24” began, Kiefer Sutherland (a.k.a Jack Bauer) appeared on the Fox network and thanked the show’s audience for their support of the long-running program. After eight seasons (eight days in the show’s life), “24” was cancelled earlier this year, although the show will likely be made into a movie. However, after so many great seasons and an emotionally satisfying conclusion, it should be the audience thanking both Kiefer Sutherland and his alter ego. As the series finale began, the president of the United States, Allison Taylor (Cherry Jones), was preparing to have a historic peace agreement signed. However, the idealistic Taylor had been forced to make numerous ethical compromises in order to get the agreement signed and then discovers that Russia’s leader had planned the assassination of a Middle Eastern leader who was set to sign the agreement. Even knowing that, Taylor continued to obsessively pursue the treaty, which would likely become a major part of her presidential legacy. With the recently announced end of Fox's hit series "24," many liberal pundits are parading the show as a false depiction of the notion that "torture works." Contrary to their accusations, the Jack Bauer interrogation methods bear exactly zero resemblance to any actual interrogation techniques used by American military, law enforcement, or intelligence agents. "On '24,' torture saves lives," the New York Times's Brian Stelter writes, disapprovingly. James Poniewozik, writing on a Time Magazine blog, attributes the show's supposed approval of harsh interrogations to the "conservative politics of co-creator Joel Surnow." Any American who has serious doubts that our military and intelligence officials would allow interrogators to, say, directly threaten the lives of a terrorist's family (let alone inflict tremendous physical pain) to elicit information has a better grasp of interrogation techniques -- and the integrity of our men and women in uniform -- than most of the liberal media. Garofalo conceded she “was initially very reticent to do it, because I heard about the right-wing nature of Joel's [24 co-creator Joel Surnow] politics and the torture-heavy scripts.” But, she quipped: “And then I thought, 'I'm unemployed!'" So much for standing up for principle. Cherry Jones, who handles the role of “President Allison Taylor,” lamented “it's too bad this season's topic is not Wall Street. The torture thing is very unfortunate; I have trouble with it. Fortunately,” however, “my President,” meaning the character she plays, “is opposed to it."